Although fried bacon smells great and tastes wonderful, it might contain more fat and calories than you care to consume. Try oven broiling your bacon instead of pan frying it for a healthier alternative. Broiling allows the grease to drip off of the bacon, which means that you'll consume fewer calories and far less fat. Although broiling takes more care than frying, the pleasant flavor of the bacon and the lack of greasiness just might make it worth your while. Position your oven racks. According to Purdue University, broiling any type of meat takes a direct heat put out by a flame or an electric heating unit. Place your oven rack only about three inches from the heat source to broil bacon. Preheat your broiler. Turn on your oven's broiler and allow it to heat up as you prepare to cook your bacon. Prepare your bacon for broiling. Remove the rind from the bacon slab, if necessary, and slice the bacon if it didn't come pre-sliced. Carefully separate cold, pre-sliced bacon strips by sliding the edge of a butter knife between the slices and gently moving the knife back and forth. Place the bacon on a rack in your broiler pan. Don't let the bacon slices touch or the fat in the meat will cause the strips to stick together. Place the broiler pan in your oven. Set a timer for two minutes. When the timer goes off, carefully slide out the oven rack and flip the bacon slices over with a fork or tongs. Slide the oven rack back in and set the timer for another minute or two, depending on how crispy you like your bacon. Remove the broiler pan from the oven when the timer rings again. Season your bacon. Add a dash of salt and pepper to your broiled bacon, if desired. Eat your bacon as is, add it to a BLT sandwich or crumble up the slices to use as a healthy substitute for commercial bacon bits. 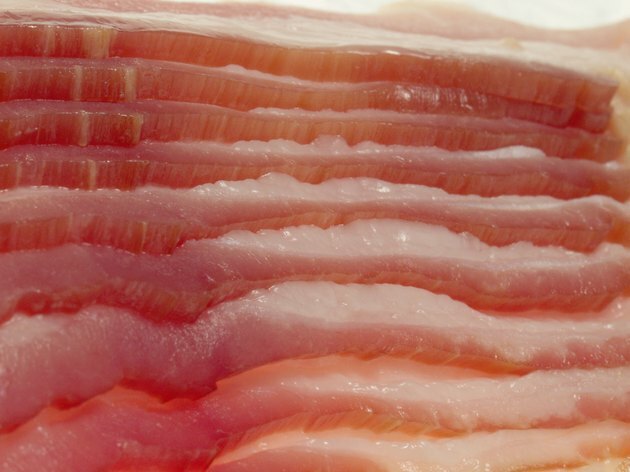 MayoClinic.com suggests eating turkey bacon instead of pork bacon for more health benefits. Read the manufacturer's directions for broiling in your oven. Some electric stoves recommend broiling with the oven door open. Don't get distracted when broiling bacon because it can burn very quickly.